Lake Forest, CA – October 23, 2018 – Cryptozoic Entertainment, leading creator of board games, trading cards, and physical and digital collectibles, and Warner Bros. Consumer Products, on behalf of DC Entertainment, today announced the October 31 release of DC Deck-Building Game: Rivals — Green Lantern vs. Sinestro. In this deck-building game that utilizes Cryptozoic’s popular Cerberus Engine, two players become iconic DC rivals Green Lantern and Sinestro and engage in direct Confrontations. As the game progresses, players buy more powerful cards and attack and defend until their opponent’s three oversized Character cards are defeated. 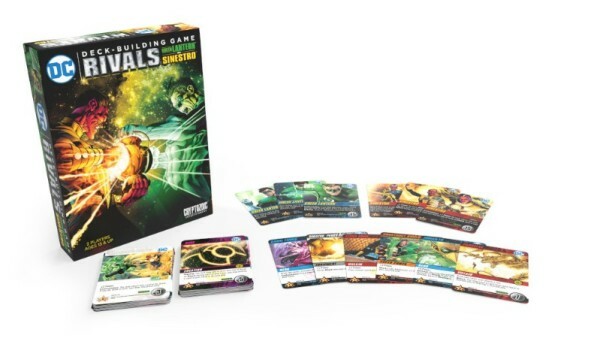 DC Deck-Building Game: Rivals — Green Lantern vs. Sinestro will be available at retailers nationwide starting October 31 for a suggested retail price of $20.